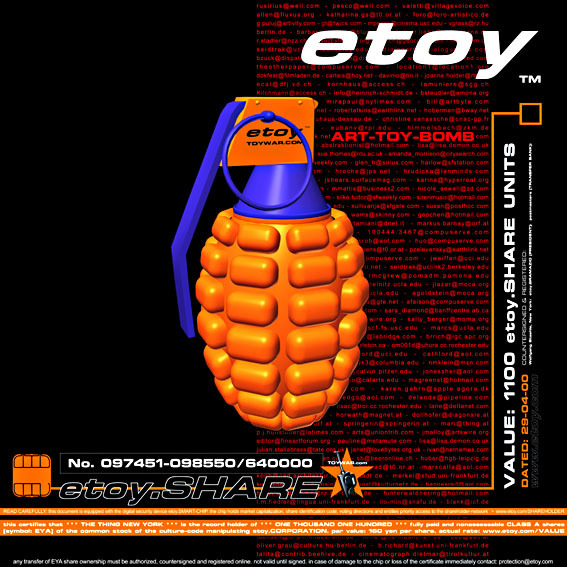 the TOYWAR.com NET.ART.PRODUCT was designed in november 1999 to prevent the destruction of the etoy.ART-BRAND and to research the potential of an elaborate, effective but playful resistance system against the old fashioned corporate bulldozing power used by eToys Inc. (one of the biggest e-commerce companies in the world / incorporated 1996) who attempted unsuccessfully to take over the etoy.com art brand. 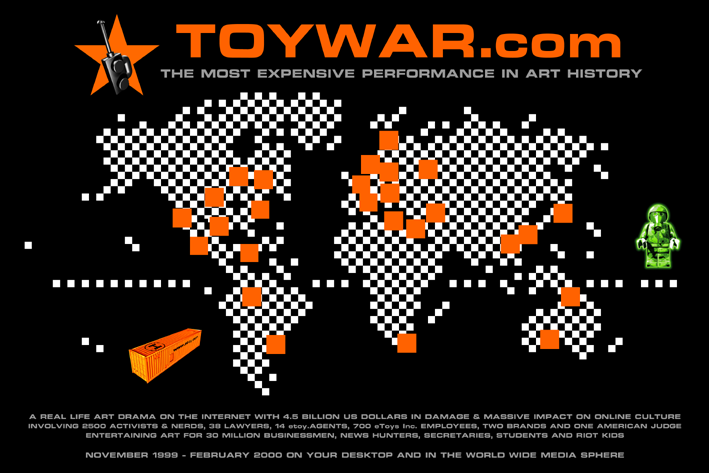 TOYWAR.com did not follow common political strategies: TOYWAR.com successfully mobilized the net-community (among them hundreds of journalists), involved the enemy in a insane TOYNAM situation (preventing overview by fighting on too many layers with the help of 1799 soldiers) and turned eToys aggressions against themselves (martial arts for the net) until art finally neutralized the naive power of money. by playing a game on the web, in the court room and on the NASDAQ the etoy.CORPORATION and supporters forced eToys to step back from their aggressive intention. the reason for this success was the combination and involvement of all kinds of people (artists, lawyers, riot-kids, university profs, business people, freaks and djs). TOYWAR IS BEYOND YOUR CONCEPTION OF REALITY! THIS IS ITS BENEFIT. NO ONE CAN CONTROL IT... 1799 RECRUITED AGENTS BUILT ITS DISTRIBUTED BRAIN WHICH IS TOO COMPLEX TO DESTROY. MONEY & POWER DO NOT EVEN TOUCH THIS SYSTEM. EXAMPLE: dj-toys submitted TOYWAR.lullabies which became the original soundtrack of the this action. more than 50 specific songs / tracks for a resistance CD were uploaded within a few weeks. in return for their participation and brand protection 1799 TOYWAR.agents received etoy.SHARES: the toy-soldiers became part of etoy and now join in the decision making process about the future of the etoy.CORPORATION: voting and share exchange systems are installed and anticipate exciting community interaction (most interesting question: will the SHAREHOLDERS sell the etoy.DOMAIN for 1 million dollars or not?)... with this move etoy went one step further: from the dissolution of the artists individuality (uniformed etoy.AGENTS) etoy now totally transformed into a community-corporation that totally denies the individual artist identity by involving hundreds of people: the investor is the designer is the coder is the lawyer is etoy. daily business operations are executed by the etoy.MANAGEMENT. the corporation now numbers about 300 regular etoy.SHAREHOLDERS and about 1400 registered TOYWAR.investors who have voting rights as well.